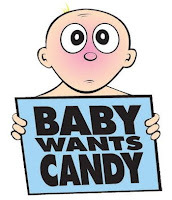 Baby Wants Candy The Completely Improvised Full Band Musical is sure to be on everyone’s list of Fringe favorites. A totally different show every time you see it, the cast performs an entirely improvised 60 minute musical based on any title that the audience shouts out. Immediately I questioned, "Wherever could they go with something like 'A Scotsman in Thailand'?" But the response was just as immediate. The band played an oriental theme and the actors assumed floral positions and spot-on (what they jokingly called) choreography. From then on, there was non-stop laughter (and tears from too much laughter) at the dramatic comedy that ensued. The six-person ensemble, made up of three women and three men, often played multiple roles and opposite genders yet never once confused the audience. This just made the show even more hilarious. There was never a dull moment as these talented performers sang ridiculous yet catchy songs right off the top of their heads. The band, directed by acclaimed musician and pianist in this production, Jody Shelton, was just as incredible, composing a perfect yet never before heard or rehearsed soundtrack along with the actors' inventions. Recommended to theatre lovers and mature audiences, Baby Wants Candy The Completely Improvised Full Band Musical is a crowd pleaser that will not disappoint. Although teens will definitely enjoy it, a fair warning goes out to those not interested in vulgarity. Don't miss it!